Inner Glow Nutrition: Stepping Up to the Plate—How to Change the Way you Eat! Today's guest post comes from Kristin Fraser—Holistic Nutritionist, Live Foods Chef, and Owner of Inner Glow Nutrition. You can read her past posts here. I spend most days talking about healthier foods, why we should consume them, trying to inspire people to eat them and even laying out the roadmap to do so. But I find that the most effective way to really make some shifts in people is to let them taste for themselves. 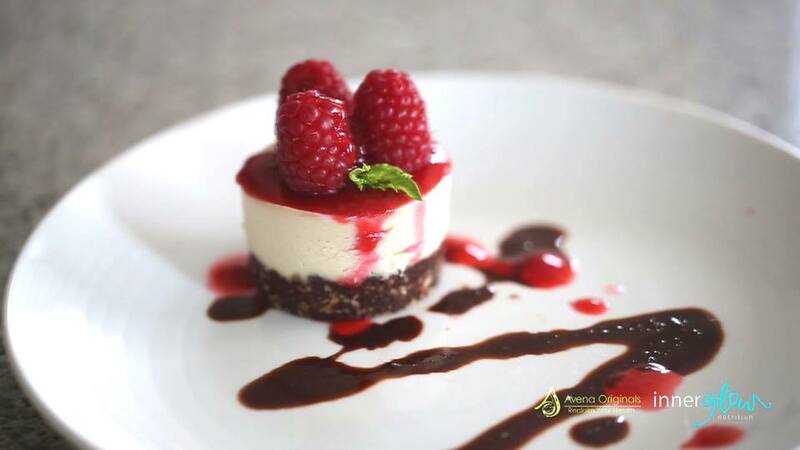 There’s something powerful about tasting a dairy free vanilla cream cake on a raw chocolate pecan crust drizzled with fresh raspberry sauce that always gets people excited. This is an amazing dessert to have for your guests. Store in the freezer for grab-and-go treats! Process almonds and pecans in food processor until nut meal is formed. Add cacao powder and blend until well combined. Add dates, vanilla and sea salt and process until crust is made. Press into mini cheesecake pan or other shallow pan. Set aside or in fridge while you make filling. 2 Cups Cashews *Soak cashews for 15 minutes if desired. Blend all ingredients except water in a Vitamix (or high-speed blender). Slowly add water. Pour filling into pressed crust and refrigerate until solid (a couple of hours). I keep mine in the freezer for a cool ice creamy treat.